After some unsettled and often thunderstormy weather during the first days of July, the forecast finally showed a large ridge of stable high pressure with 14000+ ft freezing levels from Monday July 7 onward. 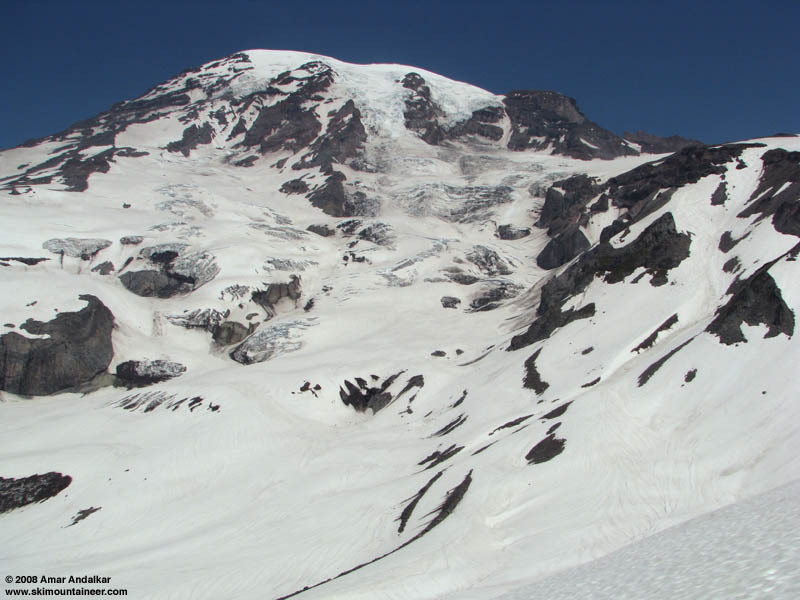 I'd been thinking about a quick solo trip up the Disappointment Cleaver route, and reading a very favorable July 6 conditions report on the Rainier blog on Sunday afternoon clinched it (same day updates? wow! ): Several of the long term guides and climbing rangers have claimed that the route might "be in the best shape they have seen for July in a decade." I expected to find lots of suncups on the DC itself, but the Ingraham-Emmons Glaciers above the top of the Cleaver looked smooth and inviting in the photos, not much worse than the last time I'd been up the route on May 30. I was packed and out the door in a jiffy, barely making it to Paradise in time to register before the 7pm closing of JVC. It was socked in at Paradise with dense fog above 4000 ft, but I knew it would be clear above the cloud deck, and the ranger confirmed it. Saw Dan Helmstadter in the parking lot, spent a while chatting with him, and finally skinned up the hill at 8:30pm. Broke above the clouds by 6200 ft just below Pan Point and enjoyed a nice but hazy sunset with a crescent moon just above the western horizon. There is solid snowcover several feet deep right from the parking lot, but the standard trail/route up has four lengthy bare sections between Pan Point and Pebble Creek (each hundreds of feet long) where the skis had to come off. Skinning conditions above Pebble Creek were excellent and fast on the refrozen evening snow, which was grippy enough not to need ski crampons and quite smooth as long as one stayed well left of the cattle stampede path. Reached Camp Muir before 11:30pm, in calm and beautiful conditions, perfect for enjoying a late dinner under the stars. Albeit a lonely dinner. Sunset view from above the cloud deck. The camp began waking up shortly after I arrived, and numerous parties were soon roping up and heading for the top. Instead, I went into the mostly empty hut for a nearly 4-hour nap. Set the alarm for 4am, waking up along with the last two remaining climbers in the hut, who were planning to bivy in the summit crater, then descend the Emmons to Camp Schurman the next day and eventually backpack all the way back around to Paradise on the Wonderland Trail over the next several days (interesting plan!). Leisurely ate breakfast and melted a couple liters of water with the Jetboil, took a few sunrise photos, and headed up just before 5:30am, with skis on pack, crampons on foot, wearing a helmet and also a harness just in case. I figured maybe 11am would be a good time to ski off the summit to hit nicely softened corn on the summit dome. Looking back at Camp Muir just after sunrise. As usual, Cathedral Gap is melted out from 10400 to 10900 ft, with a dirty slog up the ever-changing climber's path. A strong downslope wind began to hit upon reaching the Ingraham Glacier, and I took a long food and photo break in an empty tent platform at the Flats, trying to stay sheltered from the breeze. AMAZING wavy multicolored cloud layers to the east beyond Little Tahoma (was it smoke or haze? it would all be gone and totally clear by the time I returned a few hours later). Little Tahoma and wavy multicolored cloud layers. Then on up the Ingraham to 11400 ft, with a descending traverse losing only about 50 ft to reach the Nose of the DC. Fixed lines in place as usual on the rocky traverse across the Nose, then back on snow for a couple hundred feet up the steepest part of the route. Very suncupped, exposed, and not reasonable to ski this part. Then a short bit of bare rock and dirt near 11700, followed by a switchbacking ascent of the snowfield on the south flank of the upper Cleaver. Still fairly suncupped on this part, and somewhat exposed in a sidehill over large cliffs below, but it would certainly be skiable if softened enough. 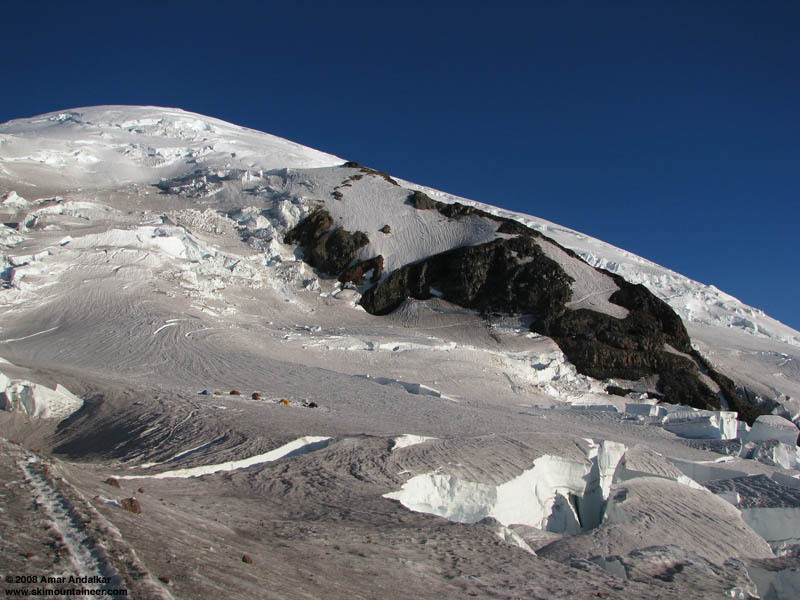 View of the Ingraham Glacier and DC, with the climbing route switchbacking up the snowfield. Reached the top of the Cleaver at 12300 ft just after 7:30am, climbing into an increasingly gusty 20-30 mph headwind on the last stretch. Up above, I could see several dozen climbers descending the glacier, and strong winds whipping snow off the upper part of the summit dome. @#$%! I really hate high winds, especially with skis on my back acting as a sail. I huddled behind a rock outcrop, mostly sheltered from the wind, and decided to wait and see if the winds would decrease. I was way too early anyway and moving uphill fairly fast, so I had plenty of extra time to kill. Over the next hour, 42 climbers would descend past me, mostly guided parties with only a few private groups. I asked several of the guides about winds higher up, and they said it had been about the same strength up to the crater rim, but then increasing to maybe 40+ mph on Columbia Crest. The summit dome with dozens of descending climbers, from the top of DC. What to do, what to do? By 9am, all of the climbers had descended and the upper part of the route looked to be empty. Unfortunately, instead of diminishing, the winds had incrementally strengthened during the 90 minutes I'd been waiting. I assumed that the strong winds would probably prevent the snow up high from softening much, but the best ski slopes on the route were from here on up to the crater rim and that's what I'd really come for. Should I fight the gusty winds for a couple of hours up to the summit, probably completely alone on the route, just to ski back down on frozen snow? I made the difficult decision to head down: feeling strong, plenty of energy, with a stove to make as much water as I needed, but just no desire to fight the winds for little reward, especially while alone. The psychological aspects of soloing even a simple dog route like this one can be overwhelming sometimes. Ready to head down the DC. Making my mixed feelings even worse was the fact that the suncupped snow on the DC had not yet softened enough to ski safely, especially with sidehill exposure leading to cliffs. So instead of skiing I just hiked back down the climbing route, now transformed from the nice set of steps I had climbed up into a pair of slippery troughs by 42 pairs of descending feet ahead of me. And the gusty downslope wind hitting the skis on my pack often threatened to send me tumbling face first, making for a very annoying and tense downclimb on the upper part of the DC. Time to put the skis on at 11400 ft on Ingraham Glacier, with a view of Mt Adams and Hood through Cadaver Gap. After the traverse off the bottom of the Cleaver, I finally clicked into the skis at the 11400 ft high point on Ingraham Glacier, enjoyed a few nice turns above the Flats, and then bounced along bumpy dirty snow to the glacier's edge. Then 500 ft more of hiking down loose choss through Cathedral Gap, following by very rough skiing on the descending traverse across the Cowlitz Glacier to Camp Muir. Somehow, even though the skiing was marginal I was still having fun, awed as always by the grandeur of the glaciers and seracs and cliffs of the magnificent Mountain. Lots of ski tracks on the Muir Snowfield. Well, at least the best snow still lay ahead: after a half-hour break at Muir to let it soften some more, I skied down at 11am. Big suncups and bumps at first, but then smooth and nice corn from 9500 down to 7500 ft along the western edge of the Snowfield, marred only by a few sets of slightly raised old ski tracks. Very nice conditions for July. The Nisqually Chute still provides a continuous snow route from Muir to Paradise, but it had looked dirty and very tracked out on the way up and I didn't want to bother with the reascent back to Glacier Vista. So I decided to just stick to the normal trail route despite its four required de-skis, and skied all the way back to the edge of the parking lot by noon. View of Nisqually Glacier and Chute. The Chute looked much worse than it appears in this photo. It was still a good trip despite the disappointing strong winds up high and lack of summiting. About 7000 ft of ascent for 5500 vertical ft of skiing ranging from marginal to excellent. And some amazing scenery in the morning light. AND WARMER DAYS. A WEAK UPPER TROUGH WILL APPROACH THE FORECAST AREA LATE IN THE WEEK. SUNDAY NIGHT...MOSTLY CLOUDY IN THE EVENING THEN CLEARING. FREEZING LEVEL 13500 FEET. MONDAY...SUNNY. FREEZING LEVEL 14000 FEET. MONDAY NIGHT...CLEAR. FREEZING LEVEL ABOVE 15000 FEET. TUESDAY...SUNNY. FREEZING LEVEL ABOVE 15000 FEET. TUESDAY NIGHT THROUGH WEDNESDAY NIGHT...MOSTLY CLEAR. FREEZING LEVEL 14500 FEET. THURSDAY...SUNNY. FREEZING LEVEL 12500 FEET. THURSDAY NIGHT THROUGH SUNDAY...PARTLY CLOUDY. FREEZING LEVEL 13000 FEET. I skied the chute on Sunday (6th) it was actually very nice. It may have looked a little dirty, but it was the smoothest snow between Muir and Paradise. I made the difficult decision to head down: feeling strong, plenty of energy, with a stove to make as much water as I needed, but just no desire to fight the winds for little reward, especially while alone. The psychological aspects of soloing even a simple dog route like this one can be overwhelming sometimes. Your wisdom is excellent for such a young man!� I suspect the "psychological aspects of soloing" have changed for you after your reported experiences this spring.� Thanks for sharing the decision making process, and congrats on your discretion. The psychological aspects of soloing even a simple dog route like this one can be overwhelming sometimes. 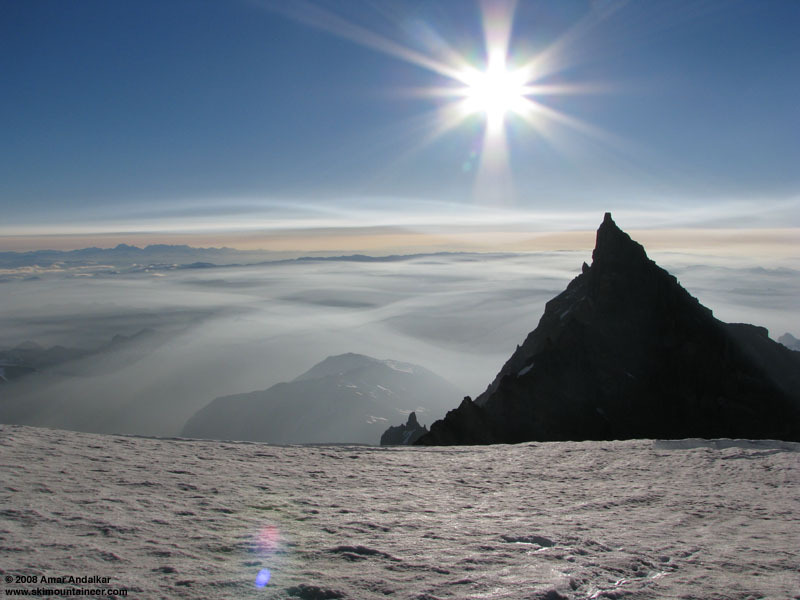 Very nice report Amar and as always some incredible pictures.� In June '06 I went up south climb on Adams solo, unfortunately without skis.� I completely understood your mention of the psychological battles that enter the mind during an endeavor like that.� Nice work, really great pictures! Your writing is captivating and informative.